Like most people these days I have a cell phone. But unlike many people, I don't use it all that much. I just like to have one for emergencies: so the school can contact me when one of the girls is not feeling well, or moms can contact me for allergy information when little H. is on a play date, or I can call the school in case I get stuck on the metro... I also like to have it with me when I take the car. Or to call K., when I'm picking up the kids from school, and want to know what he'd like for dinner when I'm running out of ideas - not really a good example of an emergency call. Another example of a typical non-emergency call is when I'm out shopping and can't make up my mind about whether or not to buy another pair of shoes - the typical answer I then get is "do you really have to call me for that?" - and he's right about that. That's my user profile! On an average day I use my cell phone once or maybe twice. A very uninteresting customer to phone companies, though they keep bothering me and calling me at the most inconvenient times of the day, for all kind of upgrades. Or with offers for more text messaging. During one of these calls some time ago, I had the hardest time explaining to them I don't use text messaging at all. "But with this new offer you'll be able to send (a certain number) of messages for free between (a certain time of the day) and (a certain time of the day)". I DON'T CARE how many I can send for free - I DON'T SEND "des texto's", as they call it here! M. likes to send texto's and so does my mom. She does it with my phone, as she doesn't have one of her own and we want to keep it that way, at least for a couple more years. While we were on vacation in the mountains a couple of weeks ago, they sent quite a bunch of messages to each other. Very cute, I admit! But often, when I see all those people on the street, in their cars, on the metro, while pushing strollers or shopping carts, ... frantically pushing those buttons I wonder "What's so important?". I have this extremely exaggerated "scene or theory" about how people communicate and see each other these days. Let's say two friends A and B decide to meet for coffee during their break. How long does it take before one gets a call or a message, you think? A couple of minutes maybe? Let's say A is the first one to get a call. So A starts a conversation on the phone, while B is sipping from his or her coffee. Slightly bored, B starts to check his/her messages. By the time A is finished with his/her call, B is completely absorbed by sending text messages, such that he or she hardly notices A is trying to tell that he/she has to start heading back. As soon as A has left, B realizes they didn't talk at all and that he/she forgot to mention so and so, upon which B decides to give A a call... Totally exaggerated, I know, but all I'm trying to say is that cell phones can be highly disruptive to normal conversations. Also, does one really need to be available all the time? That said, I do have a cell phone and even a cell phone can be a source of inspiration! Last Saturday, while I was sewing more labels into M.'s cloths for her trip, my fingers started to itch. I had to make something! And preferably something with the "HERMES" leather I got a while ago. 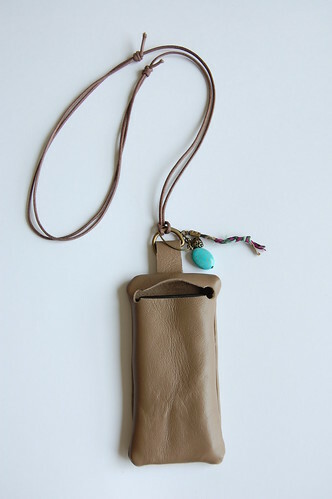 That's when I came up with this leather cell phone case. 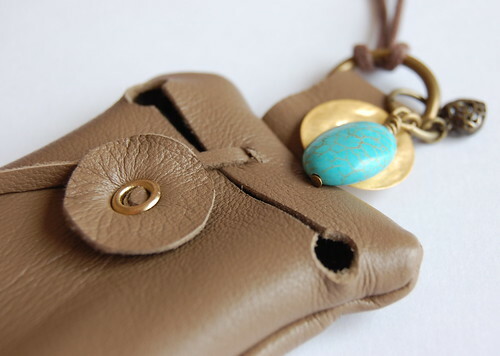 When I was M.'s age and left on my "classe verte" we all had our pocket money in a little coin purse around our neck. Every single girl I knew had one those. It was a hype in those days. And since I can never find my cell phone in my purse when I need it (not very often, but still), I more than once literally thought I should be wearing it around my neck. 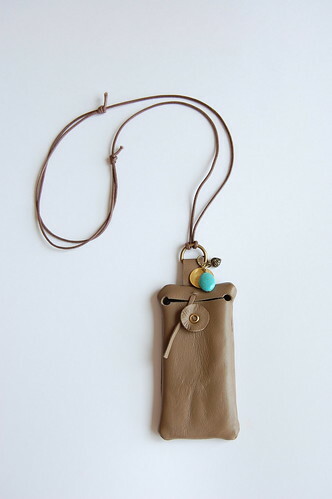 And that's how the idea for this cell phone purse grew. I first thought of adding a button, but couldn't find one that I liked enough. And then I remembered a purse my dad once gave me (I still have it, but can't remember right now where it went), which had a leather button and dito loop to close it. Instead of a loop I just cut a thin strap to twist around the button. I added an adjustable (!) dark cotton string and a couple of charms (which I changed a couple of times). And that's it! When I it showed to M. she immediately said "But, mom, you're not supposed to wear a cell phone too close to your body, because of the waves! ".